Our resource supports the study of philosophy and ethics in relation to Christianity and Islam. 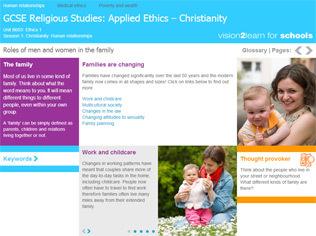 Designed to enable learners to think about real-life issues, they’ll learn how to explain key ethical and philosophical ideas, form personal insights and express their views, while developing the essential reading and writing skills needed to achieve their Religious Studies GCSE . This qualification may be used as a platform into A Level RE or Sociology, or a range of careers requiring people skills including police, retail and education. To ensure learners have explored all of the Religious Studies topics that they could be assessed on as part of their GCSE, learners must complete all units. This unit is about understanding and exploring some of the key philosophical issues that surround religion including; beliefs about deity, religious and spiritual experience and the end of life. This unit is about understanding and exploring some of the key philosophical issues that surround religion including; good and evil, reason and revelation and religion and science. This unit is about understanding and exploring some of the key ethical issues that surround religion including: relationships, medical ethics and poverty and wealth. This unit is about understanding and exploring some of the key ethical issues that surround religion including: peace and justice, equality and the media.